Scientists at the Centenary Institute have developed a novel drug which could potentially be used to effectively treat patients with diabetic retinopathy; the main cause of blindness from diabetes. The Li Ka Shing Foundation - the philanthropic organisation of Hong-Kong’s richest man Li Ka-shing - has donated $4.5 million to a project is lead by RPA’s Professor John Rasko at the University of Sydney. The reactor will enable scientists at the Heart Research Institute to make specific nanoparticles that drugs can be attached to which can then be GPS tracked directly to the affected area. 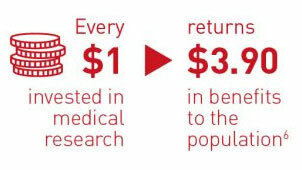 Medical research makes a significant economic contribution that extend well beyond the life-changing health outcomes for individuals. Plans have been unveiled for Concord Hospital’s new Clinical Services Building, featuring a care centre for veterans and their families. 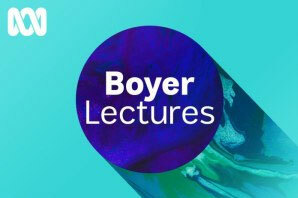 This year's ABC Boyer Lecture series, both the promises and the dangers of biotechnology with scientist and haematologist Professor John Rasko. 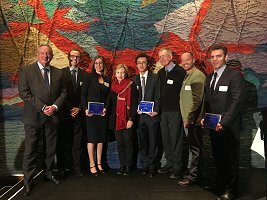 Dr Elinor Hortle was among three Centenary scientists to take home top Sydney Research prizes at the Sydney Research and Innovation Symposium in June 2018. The new Drug Discovery Initiative (DDI) unites researchers, clinicians and industry to develop promising drugs and delivery methods to improve human health. Scientists are a step-closer to developing a more effective vaccine against the world’s deadliest infectious disease. The Woolcock Institute of Medical Research has been ranked the top specialist sleep and respiratory health research centre in the world by Times Higher Education. 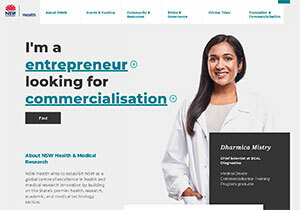 The Office for Health and Medical Research (OHMR) has launched a brand new website focused on health and medical research in NSW. 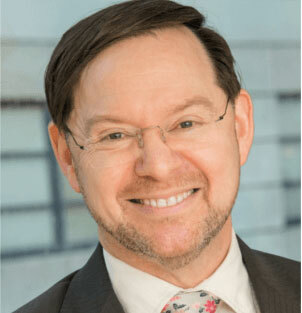 Royal Prince Alfred Hospital's Prof John Rasko AO has been named the guest lecturer for the 60th annual prestigious Boyer Lectures. Collaboration agreements with the University of Sydney. An innovative technology that delivers nanoscale messengers to the lungs wins $45,000 pre-seed funding. Dale Spriggs has become the first jockey to pledge his brain to the Australian Sports Brain Bank, which is studying the link between concussion and brain injury. Australia is poised for a boom in robotic surgery, which may make surgery more efficient and speed recovery. The Queen's Birthday 2018 Honours List has been released including Dr Teresa Anderson, Chair, Sydney Research being honoured with her AM. 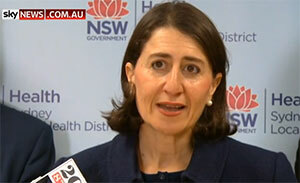 The NSW Government announced at RPA a record $150 million over the next 10 years to help researchers fight heart disease. The Australian Research Council Training Centre for Innovative BioEngineering was launched at the University of Sydney at a symposium attended by leading biomedical researchers, clinical practitioners and industry partners. 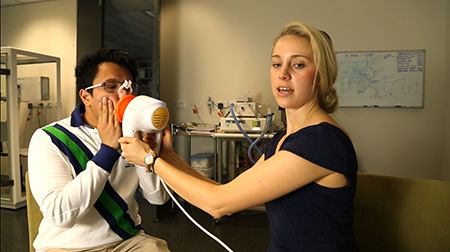 A device to help warn asthma sufferers of flare-ups is being trialled at the Woolcock Institute for Medical Research in a bid to prevent hospital visits and time off work. 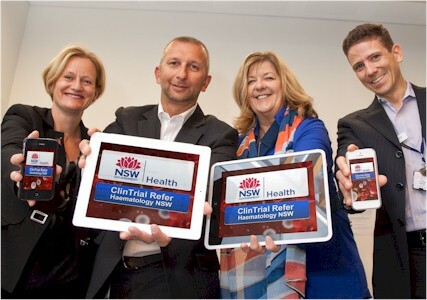 Two University of Sydney-led clinical trials took honours today, being named finalist and winner of the 'Trial of the Year' by Federal Health Minister, Greg Hunt MP and the Australian Clinical Trials Alliance. Australia's first institute for research and clinical excellence in eating disorders, a collaboration between Sydney Local Health District and the University of Sydney's Charles Perkins Centre has been launched. 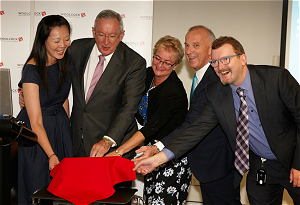 Lung cancer research and treatment is set to be revolutionised with the opening of a world-first specialist centre and research network at the Woolcock Institute of Medical Research, which was formally opened by The Hon. Brad Hazzard, Minister for Health and Minister for Medical Research. The new Faculty of Medicine and Health brings together dentistry, medicine, medical sciences, nursing and midwifery, pharmacy and public health for an integrated approach to medicine and health. 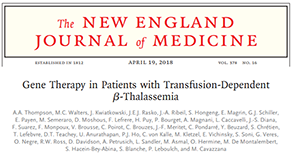 New research published in NEJM details breakthrough gene therapy that reduces or eliminates the need for the need for long-term blood transfusions patients with severe β-thalassemia. RPA's Professor John Rasko has been awarded $2m for research into CAR T-cell immunotherapy for pancreatic cancer as part of a $10m funding announcement from the Cancer Council NSW. Six former athletes have pledged to donate their brains to the new Australian Sports Brain Bank, a collaboration between Royal Prince Alfred Hospital and the Brain and Mind Centre. This work led by the Woolcock Institute of Medical Research has found household screening for tuberculosis got 2.5 times as many people onto life-saving treatments, and has been published in the New England Journal of Medicine. Investigator Associate Professor Greg Fox was the recipient of the 2016 Sydney Research Young Researcher Award. Interventional cardiologists from RPA and Concord Hospitals have been given $3.3 million to test breakthrough technology against heart attacks. Professor Paul Pilowsky is now leading a team of researchers to develop a more tailored treatment for sleep apnoea. 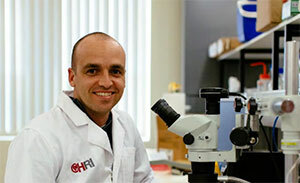 World first breakthrough for haemophilia at RPA. 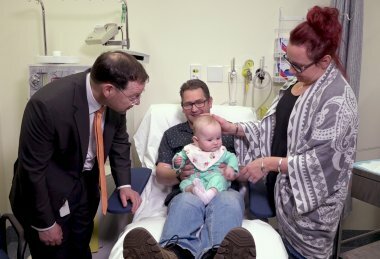 In a world first, Royal Prince Alfred Hospital researchers are among an international team to have developed a gene therapy for the life-threatening blood disorder, haemophilia. Promising MS research discovery made. Australian scientists have discovered tiny unique molecules in the blood of Multiple Sclerosis sufferers. Preterm babies' lives saved by clamping umbilical cord 60 seconds later. One of Concord Hospital's most esteemed doctors has been awarded the coveted Pride of Concord Award. Professor Lewis Chan has made an enormous contribution to the culture and standing of the hospital - attributes which epitomise the Pride of Concord. Funding for pharmaceutical manufacturing facility to bolster research and clinical trials. The MTPConnect Project Fund Program has supported the establishment of a specialist pharmaceutical manufacturing facility, Ab initio Pharma. The University of Sydney has appointed Professor Robyn Ward AM as the Executive Dean of the new Faculty of Medicine and Health, she will formally join the University on 9 July 2018. 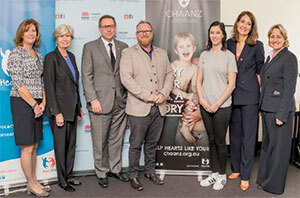 Australia’s first congenital heart disease online registry has been launched at Royal Prince Alfred Hospital. Professor Anthony Keech of Royal Prince Alfred Hospital, the University of Sydney and the NHMRC Clinical Trials Centre has been awarded RPA Foundation's top prize. Sarah McDonald who presented at the 2017 Big Idea and the Sydney Innovation and Research Symposium has now been awarded $1.47 million by the NSW Government Medical Device Fund for the "Oli" device, working with Royal Prince Alfred Hospital and the University of Sydney. Sydney academics have received $5.4 million from the National Health and Medical Research Council to investigate methods for prevention and care for people with dementia. 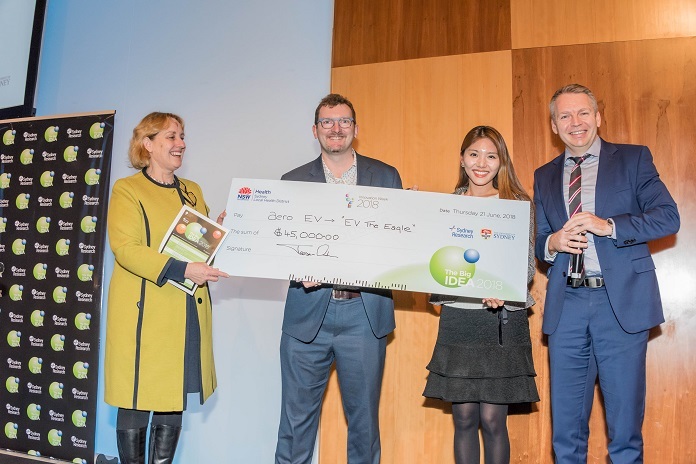 The inaugural Big Idea was awarded to Professor Gerard Sutton and Jingjing Yu of the University of Sydney's Save Sight Institute. The theory that the inaudible noise generated by wind farms can harm health is being put to the test in a Sydney sleep lab. 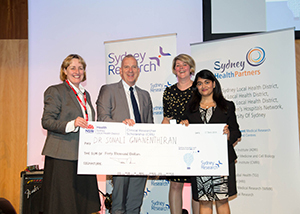 The 2017 Sydney Research Awards and Scholarships were presented at Sydney Local Health District’s fifth Sydney Innovation and Research Symposium. 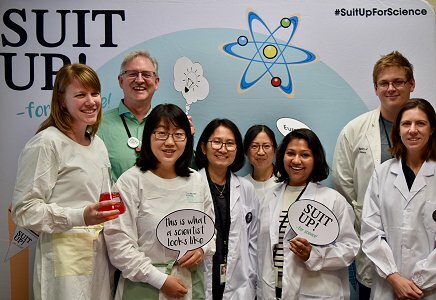 Scientists at Centenary Institute are honoured to be able to Suit Up! for Science! every day and this May, we're encouraging you to do the same to support their life saving medical research. 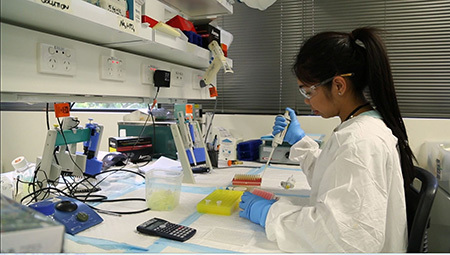 The NHMRC Clinical Trials Centre at the University of Sydney conducts investigator-initiated clinical trials with national and international collaborators, and contributes expertise to trials run by others. 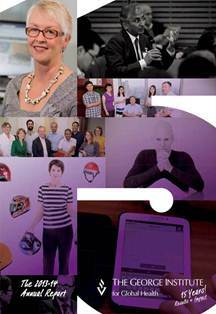 This report describes highlights of the CTC's achievements for 2016. 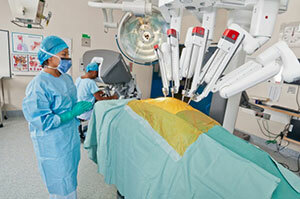 Royal Prince Alfred Hospital is now home to the southern hemisphere’s only training centre for robotic surgery. 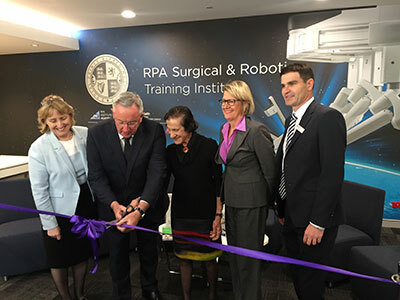 The new RPA Surgical and Robotic Training Institute was officially opened this month by Minister for Health and Minister for Medical Research, Brad Hazzard. 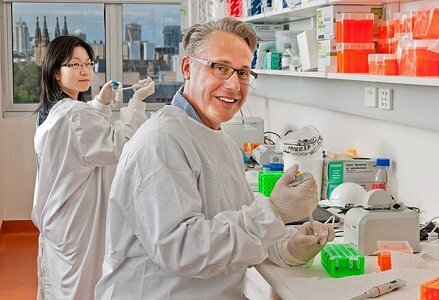 Revolutionary new cancer therapies for patients suffering with some of the most difficult-to-treat cancers are now being developed following a major discovery by scientists in the ACRF Centenary Cancer Research Centre based at the Centenary Institute. Antibacterial compounds found in soil could spell the beginnings of a new treatment for tuberculosis. A young Australian scientist is heralding hope for broken hearts with a cutting-edge tool that helps scientists fast-track exciting new therapies to mend damaged organs. 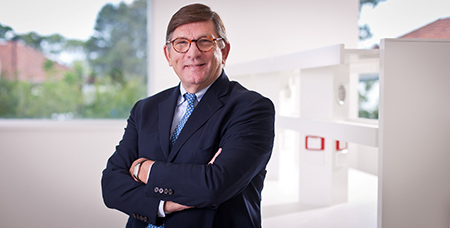 Sydney Health Partners welcomes Professor Garry Jennings AO as its new Executive Director. Sydney Health Partners is one of the first four Advanced Health Research and Translation Centres in Australia, designated by the National Health and Medical Research Council. 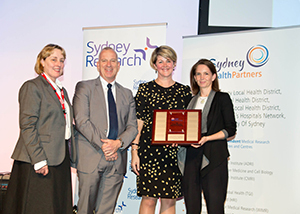 Sydney Local Health District’s fourth Sydney Innovation and Research Symposium was a roaring success with more than 1000 people attending the event. The inspiring day of thought-provoking presentations carried through into the evening with the Sydney Research Awards 2016. “This event saw some of the best clinical minds of our time come together and I have no doubt it will have a profound impact on healthcare delivery and patient care in the future,” Dr Anderson said. The Awards recognise, support and celebrate talent in research as well as those who guide and mentor researchers. They also honour the dedication of clinicians, academics and researchers working to improve the health and wellbeing of the community. Young Researcher Award: Dr Greg Fox, Respiratory Medicine RPA and Central Clinical School, University of Sydney. Dr Fox received the Young Researcher Award for outstanding performance as an early career researcher. The Award was collected on behalf of Dr Greg Fox by his wife, Dr Stefani Fox. For outstanding effort as a postgraduate research supervisor. The Annual Health Research Infrastructure Award provides $10,000 in support to a researcher with high basic science research potential. Dr Chen’s work explores the side effects of a cancer drug which provides new insight into targeting cardiovascular disease. The Clinical Research Scholarship is designed to encourage and support clinicians who want to pursue a clinical research career, offering up to $40,000 per year for up to three years. Dr Gnanenthiran’s research focus is on the effects of aging on cardiovascular disease. This very special award was introduced in memory of and to honour Professor Josette Eris. Josette Eris was an outstanding, dedicated renal physician and an inspirational leader in the field of kidney disease and transplantation at Royal Prince Alfred Hospital. She was much loved by staff and patients alike and excelled as a mentor and teacher, particularly championing women in the field of nephrology. The two winners of the scholarship were Dr Susan Wan and Dr Tracey Ying. Both are completing their PhD in renal medicine and will be able to use this vital funding to assist their research. 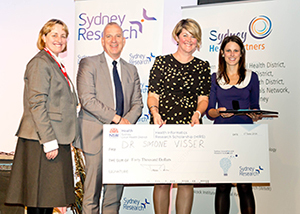 Health Informatics Researcher Scholarship: Dr Simone Visser, Respiratory Fellow, Royal Prince Alfred Hospital. 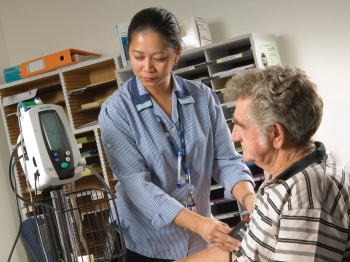 The Health Informatics Research Scholarship aims to encourage research into how clinicians, academics and researchers can improve care by working with health information and communication technology, providing support of up to $40,000 per annum for three years. 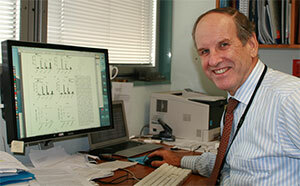 Dr Visser’s work will focus on advancing the understanding of bronchiectasis epidemiology among Australian adults. 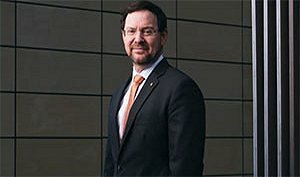 The NSW Minister for Health yesterday opened Australia's first centre dedicated to world-leading research into surgical techniques at Royal Prince Alfred Hospital. 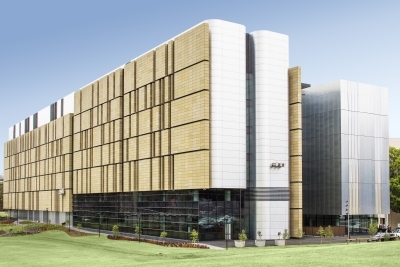 The state-of-the-art Institute of Academic Surgery features a simulated operating theatre, surgical skills laboratory, microsurgery laboratory, tissue biobank and space for clinical research and education. It will allow students to research and practise innovative surgical techniques, and advance their skills in a simulated environment before working in real operating theatres. 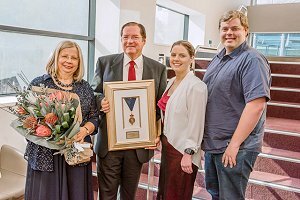 "In essence, this is what academic surgery is all about - the incorporation of research and education into everyday clinical practice to improve the lives of our patients today and for decades to come," Mrs Skinner said. "NSW is again leading the nation in ensuring our patients receive the very best care using the latest technology." 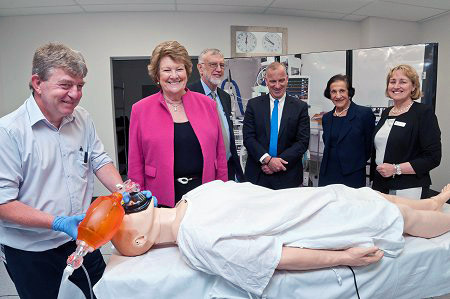 The new institute is also the platform for an exciting partnership between RPA, Device Technologies and the University of Sydney to develop the southern hemisphere's only training centre for robotic surgery, bringing research, training and clinical care together on a site with a stellar history in surgical care. RPA is the only public tertiary referral hospital in Australia with a da Vinci Xi surgical robot which allows surgeons to work with greater precision using less invasive incisions, resulting in better outcomes and improved recovery times. "It ensures we have excellent outcomes for patient care, and that is what drives our clinicians," Sydney Local Health District Chief Executive Dr Teresa Anderson said. "The minimally-invasive approach of the robot reduces the trauma of surgery, meaning patients have shorter hospital stays and can get back to their normal lives earlier," she said. Every patient treated by the robot will be part of a research study which will improve the care patients receive both across Sydney Local Health District, Australia and the world. Brooke Hollis was 20 years old when she was first diagnosed with hepatitis C. She spent two years suffering severe symptoms before developing liver failure and learning she would require a life-saving transplant. That call came in 2013, but when her hepatitis C returned with a vengeance despite having undergone a transplant, she knew her chances were not good. Her situation looked dire, until news a global clinical trial offered by the RPA liver transplantation unit and Associate Professor Simone Strasser. “It really did seem too good to be true. I knew that it was my last chance; not just to live a semi-healthy life, but just to survive,” Brooke said. 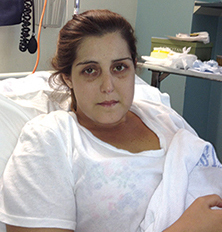 After receiving the new treatment for 24 weeks, Brooke’s hepatitis C infection was eradicated. Her liver function rapidly returned to normal and gradually her energy and enthusiasm returned. “Within just a few short weeks, I was officially hep C free. Something that I had never even imagined might be possible”. Chronic hepatitis C is a major cause of severe liver disease and liver cancer and is responsible for more than 40 per cent of liver transplants performed at RPA, and for almost all, their hepatitis C returned, Professor Strasser, a Senior Staff Specialist at RPA’s Gastroenterology and Liver Centre, said. The clinical trial of an interferon-free treatment for hepatitis C had highly effective results and a cure rate of more than 95 per cent. “The results have been truly amazing with almost all those treated being cured of their infection,” Professor Strasser said. 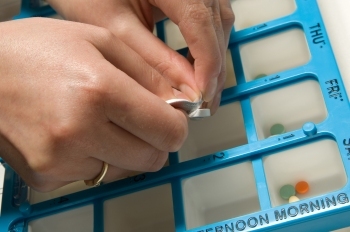 In March, these extraordinary new treatments became available on the Pharmaceutical Benefits Scheme for the nearly quarter of a million Australians with chronic hepatitis C.
“By preventing severe complications such as liver failure and liver cancer, many people living with chronic hepatitis C will not require liver transplantation in the future,” Professor Strasser said. For Brooke Hollis, the result is beyond belief. “To say I’m lucky to be alive would be a massive understatement. However, my survival cannot be completely put down to luck but predominately to the tireless efforts of researchers and clinicians who worked to develop this miracle drug,” she said. 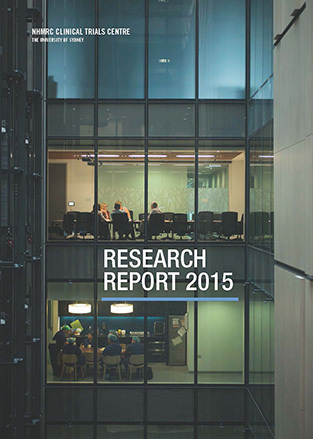 2014-15 has seen Sydney Research establish itself as one of the largest and most successful health and medical research hubs in NSW. Collaboration is at the heart of what we do and our achievements were realised because of the commitment and shared vision of our members to deliver outstanding academic, research and health outcomes. POSITIVE results in its first 6 years have proven the worth of the Asbestos Diseases Research Institute (ADRI), established in the wake of increased public awareness of the dangers of asbestos exposure, say officers of the ADRI in an update published in the Medical Journal of Australia today. Professor Nico van Zandwijk, director of the ADRI, wrote that the Institute's focus on epidemiology, biobanking, guidelines, and research into the basic biology of asbestos-related diseases had led to "rapid clinical translation". 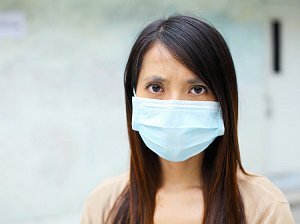 "ADRI analysis of AMR [Australian Mesothelioma Registry] data suggests that the malignant mesothelioma epidemic is slowing, but the number of older patients diagnosed with MPM [malignant pleural mesothelioma] is projected to increase until 2020," Professor van Zandwijk and his coauthors wrote. "An increase in the incidence of malignant peritoneal mesothelioma among men up to 2025 is also projected." The publication of guidelines approved by the National Health and Medical Research Council, and the establishment of a biobank for the collection of preserved tissue samples and blood are two other ADRI achievements. Perhaps the most significant development has been research that showed that levels of microRNA-16 (miR-16), a gene known for its tumour suppressor activity, are significantly reduced in mesothelioma tissues. An animal trial using the addition of miR-16 mimics was "able to halt tumour growth". A dose-finding (phase I) trial was initiated at the end of 2014 with results providing "a clear indication that the new treatment concept is worth continued investigation, and a phase II study is in preparation". "It is a good example of how, with sufficient investment, a relatively small, disease-oriented research institute can produce prominent research outcomes within a relatively short time", van Zandwijk and colleagues wrote. Royal Prince Alfred Hospital is involved in two ground-breaking clinical trials with the potential to change the way stroke patients are treated around the world. The first study assesses a minimally invasive intervention for patients suffering intracerebral haemorrhage, where a blood vessel within the brain bursts. 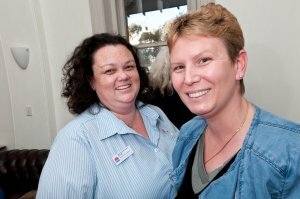 Clinical nurse consultant Kylie Tastula is the coordinator for the trial at RPA, and responsible for screening and recruiting trial participants. “The intervention seeks to remove blood from the brain through minimally invasive surgery and intermittent dosing of thrombolysis (clot busting medication),” Ms Tastula said. “Historically, thrombolysis is only used to treat ischaemic stroke, but the premise of this study is that by removing the blood clot faster, injury to the brain will be reduced and the patient’s long term outcome will be better. 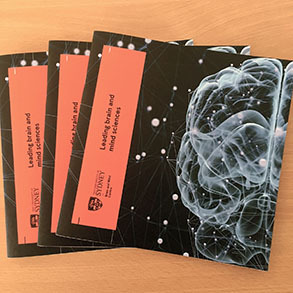 The second trial, named HeadPoST, was presented by RPA stroke clinical nurse consultant Nadia Burkolter at Sydney Local Health District’s recent Neurosciences Think Tank event. “HeadPoST aims to establish the comparative effectiveness of different head positions for patients with acute stroke,” Ms Burkolter said. Investment in early-career researchers: Is this the perfect impact point for philanthropists? It takes a healthy pipeline of talent to fuel future medical research expertise. So nurturing early-career medical researchers is critical to keeping the brightest, most promising researchers in Australia. With a limited pool of research funding available, it's often difficult for the next generation of researchers to build a track record and establish their credentials. Early-career researchers generally need funds to collect pilot data, travel to conferences or take part in further training to progress their research careers. Post-doctoral researchers are generally paid modestly through the Federal Government's National Health and Medical Research Council (NHMRC) with no allowances provided for training or travel fees. Medical research institutes generally rely on their researchers to apply for funds to provide a salary. Competition for funds at every stage is tough. "To get an NHMRC early career research fellowship, researchers need to be in the top 15-20%," explains Carol Armour, Executive Director at the Woolcock Institute of Medical Research (WIMR). These fellowships usually last 4 years only, with no guarantee of further funding. In most cases, external research funding requires proof that a proposed research project is feasible. When project proposals are submitted they usually contain preliminary or pilot data. The pilot data needs to be collected before the funding is received. Often, this means that early-career researchers are self-funding the collection of pilot data, or if they are lucky, they may have a senior mentor who can help a little. The pathway to a career in research is not easy, usually involving an initial degree followed by a PhD followed by a postdoctoral period. Early-career researchers face constant uncertainly over funding and their salaries, while ensuring that they maintain productivity to remain viable. It takes years for a younger researcher to move into the next phase of their career and receive a substantial fellowship. "To receive an independent senior fellowship from the NHMRC, candidates are usually more than 40 years old," says Armour. The costs faced to stay in and build a career in research coupled with difficulty in attracting government and private funding in research means Australia is at risk of a talent drain as young people move away from careers in research. 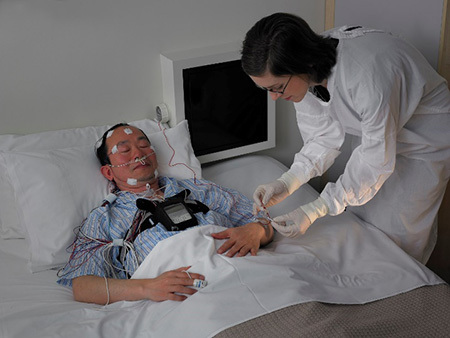 WIMR, a not-for-profit research organisation focused on respiratory and sleep disorders, has taken steps to combat this issue. Medical researchers are being proactively supported to stay in the field through a grants program that provides funding assistance to researchers with less than ten years of experience post PhD. "This initiative is designed to help early-career researchers take their first meaningful step in research so they can then apply for external funding. A key measure of success is when an early-career researcher attains external funding - usually through a fellowship that enables them to work in full-time research," explains Armour. "The next generation of leaders apply for fellowships to support their salary. They usually work in full-time research or are academic members of staff at a university." WIMR has set aside seed funding to provide researchers with the resources they need to collect pilot data and demonstrate that a proposed research project is feasible. This type of funding is aimed at helping those researchers to eventually apply for and secure larger, external grants in the future. "Competition for research funding is strong. The next generation of research leaders need to be developed with skills and experience that will enable them to be in a strong position to apply for and attract funding." WIMR has recognised that attracting and holding on to the next generation of quality researchers is intrinsically linked to getting long term impact in their research into the causes of respiratory and sleep disorders. "We are investing money and time into a group of researchers at a vulnerable stage in their career. As they go on to apply and receive fellowship positions, they will become the future leaders at the Woolcock. By providing support to our researchers at a time when they most need it, we are more likely to retain to them as staff," notes Armour. An important part of WIMR's strategic plan is to train and develop the next generation of research leaders in sleep and respiratory disorders. As a result, best practice research is being introduced as senior researchers help to train junior researchers. In a world where every research dollar is precious, those in their early-career across the sector are learning they need more than just scientific nous to attract funding. 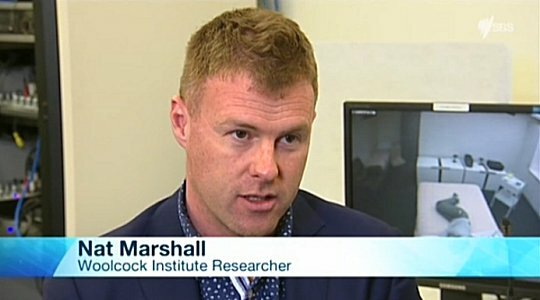 Most recently, Woolcock has started to provide media training for their early-career researchers. "We are committed to developing strong researchers that are media ready and can share their research with the world." They also seek the input of external researchers in the ongoing training of next generation researchers. "We look broadly across the research landscape to get the best people involved with training our early-career researchers." While institutes like WIMR are making investments out of their own pockets, they are interested, like many other institutes, in working with philanthropists who understand the higher risk and higher reward nature of early-career investment. Without investments from philanthropy, institutes such as WIMR face difficult internal funding decisions owing to the competing needs of keeping quality young researchers and continuing to directly support other more established teams. "There has to be a balance between providing funds to already successful researchers - which is a relatively safe decision, and providing funds to an early-career researcher - which is a perceived riskier strategy," says Armour. "This investment is incredibly important because the rewards for the entire research community are substantial. We simply can't lose the next generation of researchers to opportunities overseas." "Some of the most impactful philanthropy happens when funders are willing to invest in those critical leverage points, and in research there are few things more important than investment in the researcher - whether they are early-career or otherwise", says Perpetual's Senior Manager of Philanthropy and Non Profit Services, Jane Richmond. "We encourage our clients to be open to investment in development of researchers and their work rather than just projects because we know what impact that can have." Armour agrees. "Philanthropy can help the next generation of Australian researchers by enabling them. This could be by sponsoring their research program at the start of their careers and allowing them to achieve results. The impact will be tremendous - our brightest researchers will stay in Australia and be part of the major health discoveries of the future," notes Armour. Armour has great conviction in the payback for the investment. "We have young stars who are very keen and want to do well in research but are starving. We have to pick the best and fertilise their growth so that they become Australia's next research leaders." Recognised by the National Health and Medical Research Centre as one of only four Advanced Health Research and Translation Centres in Australia, Sydney Health Partners releases SHP News. The George Institute for Global Health is calling on governments to employ a simple text message system to improve the health of heart attack survivors, following the release of a study which shows its success at helping to reduce cholesterol, blood pressure and weight. Dr Carlo Pulitano, Associate Professor Roger Garsia and Dr Hayden Alicajic. 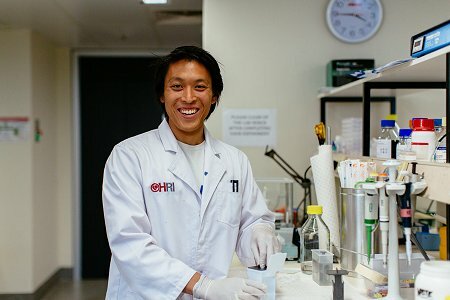 Dr Carlo Pulitano has received the Patron's Prize for clinical research for his study of techniques to revitalise human donor livers prior to transplant. 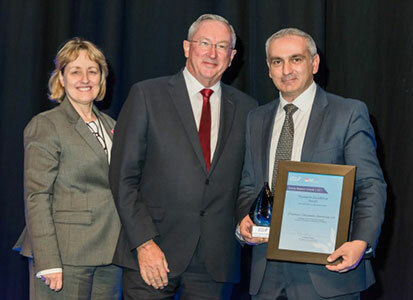 "This work has the potential to change practice and lead to better outcomes of liver transplantation," said the convener and chairman of the Patron's Prize finals, Associate Professor Roger Garsia. "His winning presentation displayed a breadth and rigour of scientific questioning that made it stand out ahead of the other presentations." RPA intern Dr Hayden Alicajic received the President's Prize for laboratory research for his work examining the uptake of quinolinic acid into primary neurons. For Associate Professor Garsia, the introduction of an annual donated prize for laboratory research was a way to stimulate laboratory based "wet" research. "Laboratory research often is less likely to capture the imagination of audiences, despite its pivotal role in driving medical progress," Associate Professor Garsia said. "The four judges were unanimous in awarding the prize and were thrilled that it had gone to a young doctor continuing to pursue his research interests whilst undertaking internship at RPA." This year, more than 23 submissions were received for the Patron's Prize and President's Prize, with eight selected to present their work during RPA Reunion Week. The judges were visiting McIlrath Guest Professor Tim Pawlik, Professor Chris Semsarian, Professor Jane Young and RPA's Director of Nursing and Midwifery Services Claire Harris. Each prize winner was awarded $1000 and an iPad to assist with their ongoing research. RPA Reunion Week concluded last week with a fascinating and often hilarious panel discussion hosted by the ABC's Tony Jones including former High Court judge Michael Kirby, comedian Mikey Robins, politician Carmel Tebbutt and media professor Catharine Lumby. Researchers at the Woolcock speak about their innovative approach to lung cancer research. 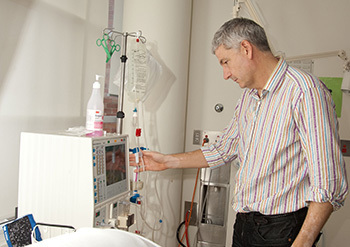 A world renowned medical research institute operating within the supportive environments of the Royal Prince Alfred Hospital and the University of Sydney, allowing scientists to be inspired by the challenges encountered at the patient's bedside, while also giving them access to the multidisciplinary capabilities of The University of Sydney. 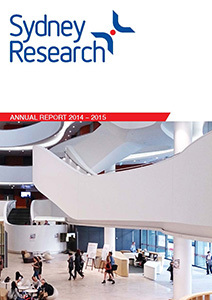 Click here for the Annual Report 2014. 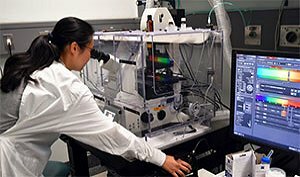 A researcher at the Woolcock Institute has developed a novel lung model that can accurately detect the effectiveness of inhaled antibiotics used to treat asthma, bronchitis, emphysema and chronic obstructive pulmonary disease. Dr Hui Xin Ong, a respiratory technology researcher, said inhaled antibiotics were also becoming the standard treatment for cystic fibrosis. "In recent years it has become clear that the treatment for these conditions would be even more effective if they delivered higher levels of antibiotics and could be used less frequently than medications currently on the market," Dr Ong said. Dr Ong is involved in developing these new drugs and decided a new tool was needed to test the effectiveness of these potential therapies. She designed her lung model, called the Calu-3 bronchial epithelium, to investigate just how these new inhaled drugs interact with the lungs. She found the Calu-3 was effective at measuring the efficacy of the drugs with simplicity, robustness and experimental control. "We still need to do further testing but we believe the Calu-3 has the potential to be the gold standard for studies of how particles interact in human airways," she said. 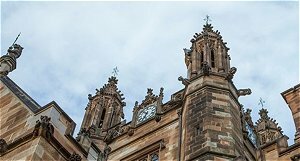 The University of Sydney's Acting Deputy Vice-Chancellor (Research) Professor Laurent Rivory, noted the model would deliver significant cost savings. The model is already being put to work in Dr Ong's Woolcock laboratory, with more complex versions in the development pipeline. Based on success with the lung model, researchers have set to work developing a cell-based lab nose which could be used to test out and improve nasal spray medications. This could help develop exciting new drugs to treat local sinus problems and diseases of the central nervous system. 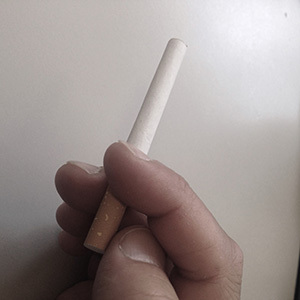 Sydney Local Health District's Professor Jane Young has been recognised for her world-first research showing a 78 per cent increase in calls to the quit smoking helpline, Quitline, following the introduction of Australia's tobacco plain packaging legislation. 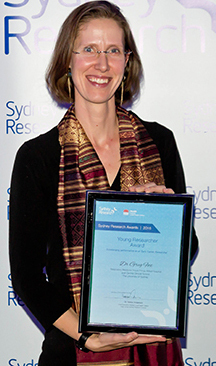 Professor Young received the Medical Journal of Australia National Prize for Excellence in Medical Research for her research paper, Association between tobacco plain packaging and Quitline calls: a population based, interrupted time-series analysis, which was named the best journal article published in the MJA in 2014. "Australia was the first country in the world to introduce this legislation so the paper is being used internationally to inform the very heated debate over whether to introduce similar legislation in other countries," Professor Young said. "This was the first time we've been able to report on a behavioural outcome so it is an important and positive finding. I hope the paper will be backed up by future research showing improvements in actual smoking reduction." France and Ireland have both passed tobacco plain packaging legislation since the paper was published in January 2014. 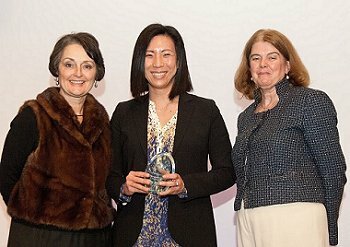 Professor Young accepted the award and the $10,000 prize on behalf of her co-authors Ingrid Stacey, Dr Timothy Dobbins, Dr Sally Dunlop, Anita Dessaix, and Professor David Currow at the Annual Australian Medical Association National Conference in Brisbane on the eve of World No Tobacco Day, May 31. "I am very excited and honoured for the team to get this recognition for what was a huge team effort involving come complex biostatistics," Professor Young said. "It is a huge endorsement and encouragement for the whole team, especially for someone like Ingrid who was a NSW Health biostatistics trainee." 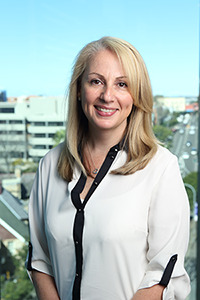 Professor Young is the Executive Director of the Surgical Outcomes Research Centre (SOuRCe), which is a partnership between the District and the University of Sydney dedicated to the advancement surgical practice through research. The third annual Sydney Innovation and Research Symposium was the greatest meeting of medical minds ever hosted by Sydney Local Health District, with about 650 people attending to hear more than 40 expert presentations on the cutting edge and future of health care. This year's symposium incorporated a special round of The Pitch innovation challenge, with Health Minister Jillian Skinner helping to judge the best ideas from staff competing for funding. A proposal to enhance rehabilitation services at Balmain Hospital by introducing a body weight supported treadmill took the top prize of $50,000, while a mobile app designed to help mental health clients track their own physical health was awarded $20,000. A pitch to establish a multisensory breast screening room to help patients feel more comfortable and relaxed received $2000 for further research and an idea to help improve sterilisation services received the full requested amount of $2000. Minister for Medical Research and Assistant Health Minister Pru Goward officially launched the symposium's inaugural Sydney Research Awards, which were presented by NSW Health Secretary Dr Mary Foley. Professor John Chalmers of The George Institute for Global Health received the award for Research Excellence, RPA's Associate Professor Sydney Ch'ng received the Young Researcher Award, Dr Kirsty Waters of the ANZAC Research Institute received the Research Supervisor Award and the Annual Health Research Infrastructure Award was presented to Dr Megan Brewer, also from the ANZAC Research Institute. 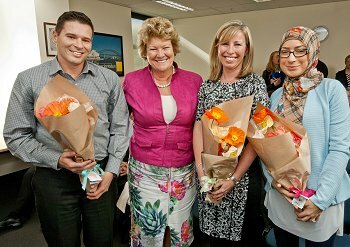 The Clinical Research Scholarship was awarded to Michelle Barakat-Johnson, Clinical Nurse Consultant in Amputation and Rehabilitation at RPA, and the Health Informatics Research Scholarship was awarded to Robyn Sierla, a Senior Occupational Therapist in RPA's Outpatient Lymphedema Service. This year's keynote speakers included the Academic Head of the Department of Colorectal Surgery and this year's RPA Medal winner, Professor Michael Solomon, Google's Head of Sales Engineering Angelo Joseph, and Tigerspike's founder and Head of Innovation Oliver Palmer. Expert presentations ranged from breakthrough treatments for cardiovascular disease and melanoma, to new approaches in palliative care and clinical education. The Great Debate over whether 'The day of the hospital is over' received spirited and colourful arguments from teams of senior clinicians and professors, some of whom used costumes, dance moves and props to emphasise their points. The audience ultimately decided that the team for the negative made the stronger case, bestowing victory on RPA's Head of Emergency Dr Tim Green, Clinical Professor of Clinical Toxicology Professor Andrew Dawson and RPA Colorectal Surgeon Dr Caroline Wright. The large atrium at the Australian Technology Park in Redfern was lined with exhibition stalls providing information and resources from a range of District services and sponsors. A 'Smart Room' also provided frequent live demonstrations of the latest technological advances enhancing patient care at the bedside throughout the day. Sydney Local Health District Chief Executive Dr Teresa Anderson said the event was an extraordinary showcase of everything the District had to offer. "This symposium was a true reflection of the skill, dedication and innovation that makes this District so effective in delivering the very best care and services for our patients," Dr Anderson said. "I would like to sincerely thank everyone who made this event so special and all of those who took time out of their busy schedules to attend." The day before the symposium the District also offered open day guided tours of its associated medical research institutes including the Brain and Mind Research Institute, Chris O'Brien Lifehouse, The Charles Perkins Centre, the ANZAC Research Institute and the Asbestos Disease Research Institute. For more photos and videos from the event visit the Sydney Local Health District Media Centre www.slhd.nsw.gov.au/media Facebook page at www.facebook.com/SydneyLHD. 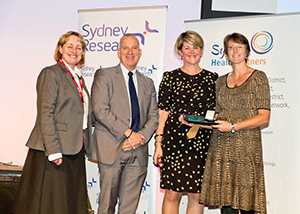 Sydney Research Awards recognise and celebrate our researchers and their efforts to improve our health system and the health and quality of life in our communities. The Sydney Research Awards and Scholarship Program, not only recognises talent in research, but also the work of those who support, guide and mentor researchers. 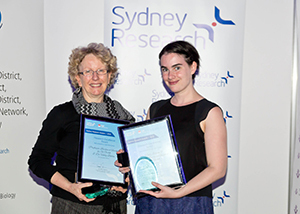 Congratulations to the winners of the Sydney Research Awards 2015. 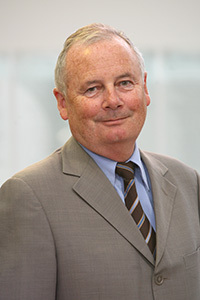 For overall best publication in a high impact journal, the 2014 (ADVANCED 2) international publication in the New England Journal of Medicine 2014 titled "Follow-up of Blood-Pressure Lowering and Glucose Control in Type 2 Diabetes, Professor John Chalmers, The George Institute received the Research Excellence Award. Royal Prince Alfred Hospital is home to some of the world's leading experts in genetic heart conditions causing sudden death. This weekend, some of our best and brightest will travel to the world's largest cardiology sub-specialty conference – Heart Rhythm 2015 – in Boston, to present their latest work in the field. We know their research saves lives - just ask Lucy Hastings. Her brother Edward died suddenly at the age of 17 while playing rugby in 2005. The cause of his death remained a mystery for the next four years until Lucy experienced ventricular tachycardia while playing netball in Dubbo. "It was a terrifying time because clearly it was a potentially lethal condition and I was not just concerned for me, but for my two older brothers as well," she says. After reviewing her family history, Professor Semsarian initiated genetic testing and discovered a mutation responsible for arrhythmogenic right ventricular cardiomyopathy. Lucy was given an implantable cardioverter defibrillator and her family was screened for the mutation. Now a paediatric registrar at the Sydney Children's Hospital, she is giving back by helping Professor Semsarian screen children in rural Cambodia for rheumatic heart disease (see photo). "Lucy's case is a perfect example of how much we have improved in diagnosis, understanding of these diseases, clinical evaluation and genetic analysis over the past 10 years, and RPA has really led that field," Professor Semsarian says. "If Lucy's brother had died today, we would have immediately activated screening of her family and implanted devices or initiated medical therapy to prevent sudden death." In 2003, Professor Semsarian and Dr Jodie Ingles established Australia's first genetic heart disease registry and clinic, which has led national initiatives regarding sudden death and genetic investigation of young people. RPA has also been at the forefront of genetic sequencing and interpreting in Australia. "Five years ago, we could analyse one gene a year and we can now look at 22,000 in six weeks," Professor Semsarian says. Researchers from the Centenary Institute have released some of the initial clinical findings to emerge from a world first genome-wide association study in alcoholic cirrhosis. The findings suggest that alcohol consumption levels may not be the only common link between chronic excessive drinkers and liver disease (cirrhosis) - it could be due to a genetic link. Through this study, a possible parental link has been identified with many of the participants with cirrhosis reporting that their father consumed excessive quantities of alcohol and had died from liver disease. Testing the genes of hundreds of Sydney-siders and thousands of others across six countries, the US government has invested $2.5 million in this Sydney‐led study to determine the role of genetics in alcoholic liver disease. Leading the study is the Centenary Institute's Dr Devanshi Seth, who says that this study should ultimately lead to better and earlier diagnosis and treatment of the condition - a silent epidemic that costs $3.8 billion a year in Australia alone. "It is widely accepted that 15-20% of chronic excessive drinkers will develop cirrhosis, although rates of up to 50% have been reported," Dr Seth said. "There is widespread acceptance among liver specialists that not all patients who drink excessive alcohol will develop cirrhosis. Our study is working to uncover the genetic factors that increase the risk of developing cirrhosis." Dr Seth said participants and researchers in this study are located in Australia, France, Germany, Switzerland, the UK, and the USA. "The study is ongoing to recruit 5,000 patients across the world. To date, we have collected approximately 50% of our total specimens," Dr Seth said. "So far, we have found that alcohol consumption levels were similar in drinkers who did not have liver disease as to those who had cirrhosis, emphasising the existence of individual vulnerability factors. We also found that affected individuals were more likely to report that a father with alcohol problems had died from liver disease, underscoring and exemplifying the heritability of this disease." In the next stages of this study it is expected that the genetic information generated will provide the first 'genetic architecture' of alcoholic liver cirrhosis and identify risk factors. This will be a significant advancement in the field of alcohol and liver research, as this level of information is not yet known for this disease. This study is being conducted by a large international consortia with multidisciplinary experts, including the GenomALC consortium. The establishment of GenomALC will lead to the largest collection of tissue and data of its kind, which will be a valuable resource for future alcohol and liver research and genetic studies. The Centenary Institute acknowledges and thanks the National Institute on Alcohol Abuse and Alcoholism (NIAAA) for the financial support for this study. Without grant funding from the NIAAA we would not be able to conduct this large, international study. Australian patients trialling a new melanoma drug have helped show it is much more effective than the standard treatment. Australia has the highest incidence in the world, with about 30 people a day diagnosed and 1,200 deaths a year. The global incidence of melanoma continues to rise, with 132,000 diagnoses every year, and 48,000 deaths. Chris O’Brien Lifehouse melanoma specialist Catriona McNeil said 14 patients from Chris O’Brien Lifehouse and Royal Prince Alfred Hospital were among Australian patients with advanced melanoma involved in the trial of a new drug, pembrolizumab. The drug works by blocking the mechanisms used by cancer to evade the body’s immune system. “These results are significant because previously available treatments for advanced melanoma such as chemotherapy and ipilimumab are only modestly effective, and at times quite toxic. The study of 834 patients with advanced melanoma from 16 countries, published online today in the New England Journal of Medicine, and presented at the same time at the American Association for Cancer Research annual meeting, included patients from the Melanoma Institute Australia, Westmead and Blacktown Hospitals and Chris O’Brien Lifehouse, in affiliation with Royal Prince Alfred Hospital and the Melanoma Institute Australia. Lifehouse patients came mainly from Sydney, Canberra and Tasmania. It compared pembrolizumab with another immunotherapy drug, ipilimumab and found that pembrolizumab “prolonged progression-free survival and overall survival and had a favourable safety profile compared with ipilimumab in patients with advanced melanoma”. Chris O’Brien Lifehouse is a world-class cancer treatment and research facility providing care and support services to public and private patients. Our mission is to improve the quality of life for cancer patients, carers and their families by advancing the understanding, diagnosis, treatment, cure and prevention of the disease. Lifehouse is an independent not-for-profit institution. Any operating surplus received by the hospital is re-invested in the Lifehouse hospital to continually innovate and improve services. Australian research published in The Lancet today shows that more than two million people globally die unnecessarily every year because they cannot access treatment for kidney failure (dialysis or a kidney transplant). By 2030 the number of people receiving treatment is predicted to double to over five million. The new findings point to an urgent need for affordable dialysis (currently US$ 20,000 - $100,000 per person per year) and population-wide prevention strategies for kidney disease. In Australia dialysis costs the Australian taxpayer around AU$1 billion a year. Lead author, Professor Vlado Perkovic of The George Institute and The University of Sydney, said the findings present a grim picture of the prevalence of kidney failure which is worse than previously thought. "The sad reality is that most of these deaths are preventable and the biggest burden lies in low to middle income countries where there are instances of less than a quarter of patients receiving treatment for kidney failure," says Professor Perkovic. "This could get worse - over coming decades kidney failure rates are projected to grow rapidly and millions of people appear doomed to die without access to dialysis without specific action, with Asia being hit the hardest," he said. "We urgently need to find ways to get people the treatment they need by making dialysis affordable, and by implementing preventative measures so fewer people develop kidney failure in the first place," he says. "Dialysis has been around for half a century, yet the technology hasn't evolved substantively, remaining hugely expensive despite its simplicity," explains Professor Perkovic, "Computers have shrunk from the size of buildings to that of a watch in this time; that's the kind of radical overhaul needed." "Effective kidney disease prevention strategies include controlling blood pressure and glucose levels, taking proven protective medications and managing key risk factors like diabetes and obesity, but archaic and inconsistent models of care and gaps in treatment such as lack of access to local health professionals stop people from getting these." In Australia, kidney disease is a leading cause of death and disability and contributes to approximately 15% of all hospitalisations. Associated with other life threatening chronic conditions like heart disease and diabetes, kidney disease is a rapidly growing yet under recognised health problem. 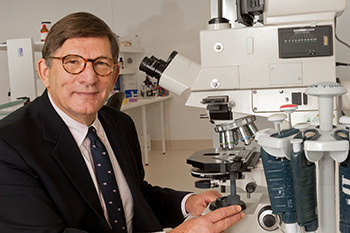 Commenting on the implications of the findings, co-author, Professor Alan Cass, director of the Menzies School of Health Research and President of the Australian and New Zealand Society of Nephrology, said these findings set a demanding task for the nephrology community and healthcare and research communities in general. "We now have the evidence we need to set global targets and a strong incentive for industry to invest in low cost technologies for dialysis," says Professor Cass. "Australia is home to some of the world's leading kidney specialists and researchers, so is well placed to play a leading role in finding innovative solutions to better prevent and treat kidney failure. Today these are major health challenges facing the global community", he said. 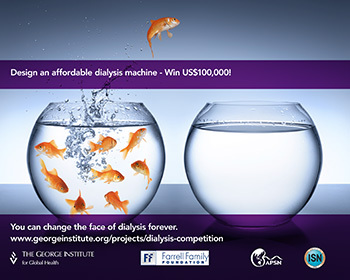 As a result of this research, a world-wide competition is being launched today to design the world's first affordable dialysis machine, attracting a prize of $US100,000. "Dialysis machines purify the blood, replacing an essential function of the kidneys. If we can develop an affordable dialysis machine with low operating costs, that runs on solar power and uses local water sources, many more people will have access to the treatment and millions of lives could be saved," says Professor Perkovic. 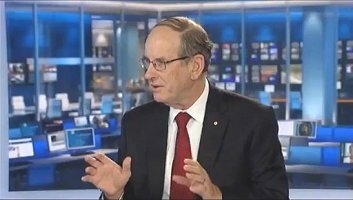 Professor Tim Mathew, Medical Director of Kidney Health Australia, says "Australians with kidney failure can be grateful that the direct costs of their treatment are covered by Medicare, around $60,000 a patient a year, while many other patients around the world are not so fortunate." "Kidney Health Australia welcomes the Affordable Dialysis Prize and commend it to engineers, inventors and visionaries everywhere, but especially in Australia, which has been the source of so many medical breakthroughs over the years." PREVENTION: Innovative models of preventative care should be piloted in low- and middle-income countries, especially in areas where access to physicians is low. Effective kidney disease prevention strategies could include blood pressure control, especially using drug classes of proven benefit and management of key risk factors including diabetes, obesity and acute kidney injury. AFFORDABILITY: More cost-effective dialysis techniques must be developed and made available. Current dialysis treatment will remain unaffordable, and therefore inaccessible, for many of the countries where access to renal replacement therapy is lowest. Considering the increase in the expected number of patients requiring treatment, dialysis provision will also represent a substantial financial burden for even the most high income countries in the years ahead. Science teachers - at primary and secondary level - who are dedicated to effective and innovative science teaching. Winners will be announced and presented with their prize money by the Prime Minister and the Minister for Industry and Science at a gala dinner in the Great Hall of Parliament House, Canberra. $50,000 for the Prime Minister's Prize for Excellence in Science Teaching in Primary Schools. For more information, go to pmprize@industry.gov.au . The George Institute 15 year anniversary annual report is now available, celebrating 15 years of results and impact on global health. How to treat brain injury in intensive care, stop repeat heart attacks, reduce healthcare costs, use mobile technology to fill in the gaps of an overstretched health system, these are some of things that are in store next at The George. Click here for the report. Royal Prince Alfred Hospital's Professor Michael Solomon believes that most surgeons could also be excellent researchers but just don't know where to start. To show them the way and enhance the hospital's surgical research culture, the Royal Prince Alfred Institute of Academic Surgery was established 12 months ago and will be officially launched tomorrow night. As Chair of the institute, Professor Solomon said the aim was to develop all aspects of surgery across the RPA campus. "What we're trying to do is change practice appropriately, teach that change in practice so that the turnover of new ideas is not 20 years it's five years," Professor Solomon said. The Chief Executive of Sydney Local Health District, Dr Teresa Anderson, said this was Australia's first hospital based institute focusing solely on academic surgery. "With surgical care provided to more than 20,000 patients each year through the efforts of more than 1200 dedicated surgical staff, RPA is ideally placed to lead innovation in surgical practice and patient care," Dr Anderson said. "I am very proud to say that the Institute is already generating significant momentum and support across the discipline of surgery - and across the Campus." The Vice-Chair of the institute, Professor Paul Bannon, said it would become a flagship for a new model of surgical research. "It won't just be focusing on how to spend more dollars on research, it will be focusing on how to teach better and measuring the outcomes," Professor Bannon said. Executive Director Katie McBride said the role of the institute was to provide a one-stop-shop for surgical departments and surgical clinicians to come to. One of the key issues that staff talk about in their difficulty doing research is that they don't have enough time so in the institute we're looking at new models where they will have a day a week or even half a day to do their research," Ms McBride said. The institute will soon launch a new website, which will focus on key areas such as academic career development, patient care, research and education, and profiles on each of the 17 surgical departments at RPA detailing the members of their team, current research themes and educational events. Royal Prince Alfred Hospital's vascular surgery department is involved in an international clinical trial which could improve surgical outcomes for millions of patients. The trial researches the benefit of using new stents and balloons for lower limb arterial occlusions that slowly release specific drugs. Dr Steve Dubenec said that by slowly releasing drugs, the balloons and stents could minimise the risk of an over-healing response to the surgery and help prevent disease recurrence. "We're in the process of refining the drug eluding technology which could be mean fewer procedures for the patient better long term results," Dr Dubenec said. The technology is being tested in 15 centres in Europe, Australia and New Zealand, and if successful, could benefit millions of patients around the word. Dr Dubenec said the trial was just one way RPA was working to improve understanding of the effectiveness of various surgical techniques and devices. "We also have a great worldwide registry of aortic stent grafts, in which RPA is the principle site and I am the primary investigator for Australia and New Zealand," Dr Dubenec said. "There are 2,500 patients enrolled in that study to date worldwide. It is growing every day." This project examines short and long term patient outcomes, issues with devices being implanted and ways in which existing technology could be improved. "Because we can pool that global data we get a much clearer idea of exactly what is happening and we can come to better conclusions about ways devices can be developed in the future," he said. "The numbers we are getting are big enough that we can start looking at specific things in relation to aortic stent grafting which we weren't able to do on a single centre basis or even an Australian basis." Dr Dubenec gives presentations on the registry at several international conferences each year. When Jill Schofield’s mother died from an aggressive brain tumour, she already knew her mum’s wishes - to leave her brain to science to help develop treatments for future generations. 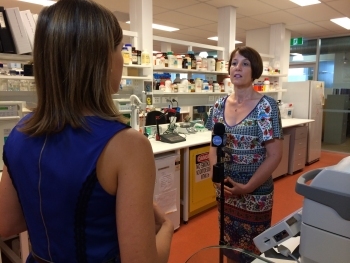 Today, Ms Schofield, pictured being interviewed for Channel 10 news, told her story at the official opening of the renovated RPA Neurosciences Laboratories in Camperdown. The laboratories, opened today by the Minister for Health and Minister for Medical Research, Jillian Skinner, provide highly specialised services in Sydney Local Health District and across NSW, including surgical neuropathology, brain tumour diagnostics and research, autopsy neuropathology, as well as muscle and nerve biopsies. 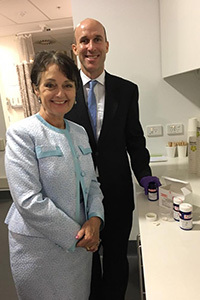 Minister Skinner said the $300,000 renovation of the laboratories at RPA was a key example of the NSW Government’s approach to supporting localised research hubs across the state. 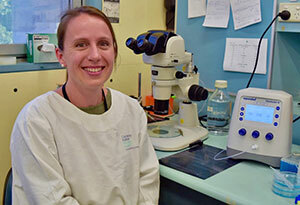 “The renovated neuropathology laboratories at Royal Prince Alfred Hospital are a great example of the results that can be achieved when working together at a local level as part of a research hub,” she said. “By local health districts being integrally involved in research hubs, our health services will be enhanced not just by the research, but by the culture of research and evidence based practice that develops across services,” Minister Skinner said. RPA neuropathology is the only department of its type in Australia. The laboratories include a specialised brain and spinal cord cutting and processing laboratory, and a dedicated Creutzfeldt-Jakob disease diagnostic laboratory. Clinical Associate Professor Michael Buckland said brain cancers were some of the most aggressive forms of cancer and the most common type, glioma, remained a very serious diagnosis despite recent advances in medicine. “New equipment in the laboratories will help us investigate how gliomas form and progress, providing insights into new treatments and helping to detect glioma in its earliest stages,” he said. Tuberculosis is often a death sentence for Vietnamese people diagnosed with a nasty drug-resistant form of the lung disease. 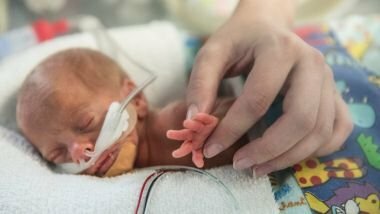 But researchers at the Woolcock Institute of Medical Research in Sydney are working to change that with the help of an antibiotic they hope could protect thousands of relatives from catching the deadly disease from their sick loved ones. If successful, the five-year project will grab the attention of policy makers worldwide and change the face of TB treatment in both developed and developing nations. Tuberculosis, a bacterial lung infection, is a major problem in Vietnam where 190,000 people live with the disease. TB killed 19,000 residents in 2013, many of whom had been diagnosed with a hard-to-treat multi-drug resistant type that can be fatal. 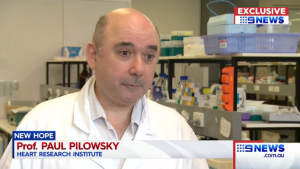 "The drugs to treat it are expensive, toxic, slow working and frankly not very effective, so the prognosis for these patients is often not good," says respiratory physician Dr Greg Fox, a chief investigator on the study, supported by a $3.2 million NHMRC grant. "We're hoping to change all that." The research team is looking to halt the spread of the contagious disease with an antibiotic called levofloxacin that will be given to relatives of TB patients. As Dr Fox explains, family members are at high risk of becoming infected with the bacteria, a state called 'latent TB infection' that can later progress to active TB. Antibiotics are known to help prevent TB in relatives with standard drug-susceptible disease but the effectiveness of preventive therapy for family of patients with the more deadly multi-drug resistant form is yet to be tested. Researchers based at Woolcock's Vietnam office will put it to the test with a randomised controlled trial of 3000 relatives to be recruited over three years from 10 provinces across the country. These patients will take either the antibiotic or a placebo pill daily for six months, with follow-ups for two more years to see who develops TB. If results show levofloxacin therapy prevents drug-resistant TB then it will have major implications for control of the disease, Dr Fox says. "This would be a transformative advance in knowledge about this type of tuberculosis, and something that would be of considerable interest to clinicians and health authorities the world over," he says. "But most importantly, such a discovery has the potential to protect tens of thousands of people from the suffering and death too often associated with this disease." For further information contact Lucy Williams, media consultant at the Woolcock Institute of Medical Research, on 0403 753 028. "This centre will be an ongoing example of the best of collaborations between China and Australia, to the benefit of both countries and the world." 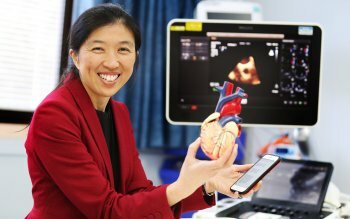 One of the world's largest mobile chip manufacturers and an Australian-based global health research institute have set up a new research centre in China aimed at making an international contribution to mobile health (mHealth) innovation. Hosted by The George Institute for Global Health at Peking University Health Science Centre and funded by Qualcomm Wireless Reach, the China Centre for mHealth Innovation (CCmHI) aims to develop and test solutions that can improve the health of people in China. These solutions will be highly applicable to health systems across the globe as countries like Australia are also looking for innovative approaches to deliver safe, less expensive and high quality health care to its citizens. The CCmHI will target the leading causes of premature death in China including stroke, heart disease, lung disease, diabetes, kidney disease and cancer. Many of the risk factors for these conditions are shared. Rather than tackling each disease one by one, the CCmHI will take a whole of health system approach to addressing these diseases. Working with central and provincial governments, CCmHI will help improve community healthcare in China by developing mHealth tools and solutions, conducting high quality clinical trials and contributing to strategies for the implementation and scale-up of effective affordable mHealth tools. "The George Institute is proud to partner with Qualcomm in the establishment of CCmHI as a world-class centre for mHealth innovation," says Stephen MacMahon, Principal Director of The George Institute for Global Health and Professor Cardiovascular Medicine at the University of Sydney. "There is a pressing need for fresh approaches to community healthcare in China and globally, particularly in resource-poor areas. CCmHI will address this need by developing new mHealth strategies designed to improve care for individuals at high risk of stroke and other important causes of premature death and disability." "This centre will be an ongoing example of the best of collaborations between China and Australia, to the benefit of both countries and the world," Professor MacMahon said. "Some of the projects we will be trialling through this centre have already been evaluated in Australia, and will be adapted for use in China. Similarly the results of research involving tools developed in China may also be applicable in Australia and around the world. "We're also looking forward to mentoring students from China who may wish to develop their expertise by studying in Australia, and taking those skills back to China." MHealth reseacher Associate Professor David Peiris, of The George Institute and The University of Sydney, said mHealth has great potential to solve health care system problems facing both China and Australia. Similarly in China, where access to doctors can be grossly limited, mHealth systems and tools offer an alternative way of delivering healthcare to economically disadvantaged populations at a fraction of the cost. Associate Professor Peiris said that despite the "bold promise" of mobility to deliver a higher standard of healthcare at a lower cost than the status quo, there is surprisingly little research demonstrating what works. "Particularly in low and middle income countries, mobility could enable health care authorities to explore alternatives to higher-cost, doctor-centric models. Using other players such as community healthcare workers equipped with mobile diagnostic applications can support improved access to healthcare and frees up valuable doctor time for more complex tasks. "Cloud and mobility also have the potential to promote consumer-driven healthcare where diagnostic and treatment information will be more easily available to individuals. It also could improve safety in hospitals where healthcare providers will have improved access to patient information via electronic health records. "In addition, telecommunications companies are investing heavily in cloud-based telemedicine services which enable the diagnosis and treatment of people in rural and remote areas." The first activity of the CCMHI will be an in-depth landscape analysis of mHealth tools and infrastructure already being utilized in China primary care settings. 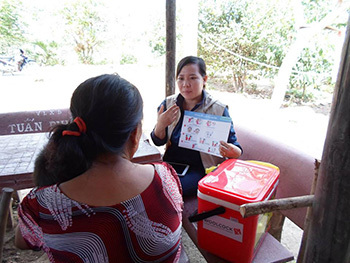 From this analysis, the team will evaluate potential gaps and/or additional mobile tools, which are particularly well suited to address the most pressing concerns for community health throughout China. These tools will be developed by local technology partners, then tested in research trials for efficacy and cost effectiveness. The George Institute for Global Health is improving the lives of millions of people worldwide through innovative health research. Working across a broad health landscape, the Institute conducts clinical, population and health system research aimed at changing health practice and policy worldwide. The Institute has a global network of medical and health experts working together to address the leading causes of death and disability. Established in Australia and affiliated with The University of Sydney, the Institute today also has offices in China, India and the United Kingdom, and is also affiliated with Peking University Health Science Centre, the University of Hyderabad and the University of Oxford. The George Institute prioritises clinical and population health research that produces outcomes that are easily translated into practice, and effect real change within a short period of time to health policy and practice. The Institute has been ranked among the top 10 global institutes for impact for the last several years, and its research has resulted in changes to medical guidelines and ways of thinking about some of the most common medical treatments around the world. Examples include developing a new treatment for stroke, showing that blood pressure lowering reduces the risk of cardiovascular disease in people with diabetes, and providing safer fluid options for patients in intensive care. Developing better methods for delivering health care are a priority for the Institute. Dietitian Merran Findlay: "I'm delighted to have this opportunity to undertake the Fellowship among leading multi disciplinary cancer clinicians and translational cancer research experts". Royal Prince Alfred Hospital's Senior Oncology Dietitian, Ms Merran Findlay, has been awarded a prestigious National Health and Medical Research Council Translating Research Into Practice (TRIP) Fellowship. 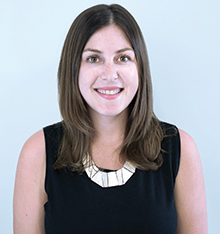 An Advanced Accredited Practising Dietitian, Ms Findlay's expertise in nutrition support of patients with head and neck cancer has been recognised internationally through her award-winning, innovative work in online evidence-based guideline development for this complex patient group. "We know malnutrition is prevalent in people with head and neck cancer and there is strong evidence that access to specialist dietetic services before, during and after treatment is required in order to optimise patient outcomes," Ms Findlay said. "However, translating the best available research evidence into clinical practice can often be challenging in the real world." The highly competitive TRIP Fellowship Scheme is intended to build capacity in research translation by providing support for health care professionals to undertake projects focussed on translating evidence into practice to improve health care and public health. One of only 10 TRIP Fellowship grant recipients nationally, Ms Findlay was awarded $172,911 over two years to support an implementation project entitled Best evidence to best practice: Implementing an innovative model of care for nutritional management of patients with head and neck cancerto be undertaken in partnership between Sydney Local Health District and The Chris O'Brien Lifehouse. 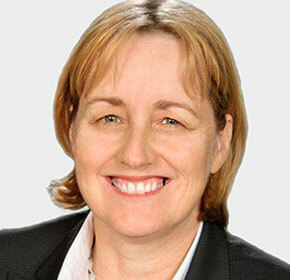 "I'm delighted to have this opportunity to undertake the Fellowship among leading multidisciplinary cancer clinicians and translational cancer research experts," Ms Findlay said. "Exercise is not just for getting fit; most would be surprised by the range of important health conditions that can be helped by the right type of exercise." Exercise can help millions of people, from babies to the elderly, recover from important health problems, the world's largest clinical research database for physiotherapists has revealed. The Physiotherapy Evidence Database (PEDro) is based at The George Institute for Global Health and indexes reports of more than 28,000 guidelines, trials and reviews. It is used by thousands of physiotherapists and others interested in rehabilitation in more than 200 countries, and celebrates its 15th anniversary in October 2014. PEDro Manager Anne Moseley, of The George Institute for Global Health and The University of Sydney, said: "We searched the database to find the top five common health conditions proven by research to benefit from exercise. Unfortunately people tend to under-estimate the role of exercise in health care. Exercise is not just for getting fit; most would be surprised by the range of important health conditions that can be helped by the right type of exercise." Pelvic floor muscle training improves urinary incontinence in people with stress or any type of urinary incontinence. This is the first-line treatment for urinary incontinence. "Urinary incontinence is estimated to affect more than 200 million people worldwide. The best way to improve this is by sticking to specific exercises." Therapeutic exercise decreases pain and improves function in people with knee osteoarthritis, with the same effect size as pharmacological treatments. People with hip osteoarthritis are also likely to benefit from exercise. "Over 10 per cent of people over 60 years suffer from osteoarthritis of the knee, with women more likely to be affected than men. Many people could benefit from drug-free treatment that has the same size of effect as medicines, without the same side effects." Physical training decreases death, breathlessness and fatigue and improves health, quality of life and function in people with chronic obstructive pulmonary disease. "An estimated 64 million people had COPD worldwide in 2004. It's more than a "smoker's cough", and there's a lot exercise can do at home to offset the effects." Exercise programs decrease the rate of falls and risk of falling for older people living at home. Balance exercise is the most effective. "Around the world, 37.3 million falls occur each year that are severe enough to require medical attention. It's a world-wide problem, particularly among those over 65. Exercise programmes are the best way to combat the risk." Early intervention programmes for preterm infants reduce motor delay. "More than one in ten babies, or 15 million babies a year, are born too soon. Survivors can face a lifetime of disability. Studies show that physiotherapy programmes for these babies help them with movement skills." Dr Moseley said: "Our bodies have this most marvellous ability to heal themselves. For some conditions, exercise can have profound effects on healing." "It is important to understand that there are many different forms of exercise and you need to use the right approach to get the best results. Sometimes people don't appreciate this important fact. "That is why advice from a physiotherapist can be so useful. Guided by the evidence on PEDro they can help set you up with the specific exercise program that will make a difference to your life." Leading researchers Professor Cathie Sherrington, Professor Chris Maher, Professor Rob Herbert, and Associate Professor Mark Elkins, all from The George Institute and The University of Sydney, also head the PEDro project. Sydney Local Health District is close to opening one of our most advanced and exciting projects to date - a beautiful state-of-the art $67 million mental health facility on the Royal Prince Alfred Hospital campus. In honour of one of mental health's most passionate champions and an adored member of the RPA family, the building will be officially named The Professor Marie Bashir Centre. A NSW Government joint initiative with the University of Sydney, the centre will feature an aesthetically beautiful design complete with stunning wall murals and peaceful outdoor gardens, aimed at creating a more homely environment for patients and their families. Sydney Local Health District Chief Executive Dr Teresa Anderson says there was no one more appropriate to be named as patron than Professor Bashir. "She is much loved by the staff and patients of RPA and SLHD," Dr Anderson said. "Her commitment to improving the lives of people living with a mental illness, her compassion, and her ability to make every person that she comes into contact with feel special and important is inspirational." Details of the official opening will be announced soon. A new alliance of experts in emergency medicine, critical care medicine and infectious diseases have joined to push for increased awareness and earlier intervention to fight the unfolding threat of sepsis, a little-recognised condition that kills more people than prostate cancer and breast cancer combined. 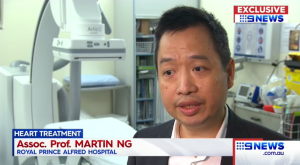 Critical care researcher Professor Simon Finfer, of The George Institute and The University of Sydney, says the true rates of death are likely even higher than currently thought because many deaths due to sepsis are attributed to other underlying diseases. Sepsis is the life-threatening condition that arises when a patient’s response to an infection damages their tissues and organs. 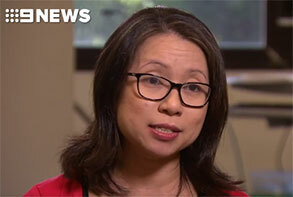 Of the 30,000 Australians thought to contract sepsis each year, about a quarter of adults die without leaving hospital. The death rate for children is lower, at about 10 per cent. “More people die of sepsis than from well-known diseases such as prostate cancer and breast cancer combined,” Professor Finfer says. “My key point is that, if sepsis is recognised and treated early death can be prevented; each hour’s delay in the treatment of sepsis increases the risk of death by about eight per cent. Clinical Excellence Commission CEO Professor Cliff Hughes says he is delighted that the Australian Sepsis Network is joining the fight against sepsis. In an economic analysis, the CEC estimates that medical services to treat sepsis could cost NSW $3.7 billion over the next 10 years. The CEC has implemented a program known as SEPSIS KILLS since 2011, which has already improved outcomes in 180 hospitals across NSW. There has been a significant decrease in the median time to commence treatment with intravenous antibiotics from 4 hours in 2011, to consistently less than 60 minutes in 2013 and 2014. The Commission has developed a number of initiatives aimed at reducing the prevalence of infections that occur in hospitals including a National Safety and Quality Health Service Standard for Preventing and Controlling Healthcare Associated Infections, National Hand Hygiene Initiative and Antimicrobial Stewardship Program. Sydney-based electrical supervisor Michael Sutton, whose wife Sharon died this year from sepsis, welcomed the move to boost efforts to fight sepsis. “I tell the guys at work that she died of sepsis after leukaemia. They all know what leukaemia is. But they say: ‘What is sepsis? The Australian Sepsis Network is a new group of researchers, health groups and clinicians who work together to improve the outcome of patients with sepsis. They believe it is crucial to raise awareness of sepsis, the early warning signs, and how to prevent death, and today launched a new website. Professor Michael Solomon (centre) with Channel 9’s Kate Creedon, RPA General Manager Deborah Willcox, SLHD Chief Executive Dr Teresa Anderson and Director of Research Professor Warwick Britton. This year’s prestigious RPA Foundation Research Medal has been awarded to Professor Michael Solomon for his significant contribution to research, in the field of surgery. Professor Solomon was presented with his medal, and a cheque for $50,000, at an event held in the Kerry Packer Education Centre today. The medal was established in 2000 to award and recognise excellence and outstanding achievement in medical research. 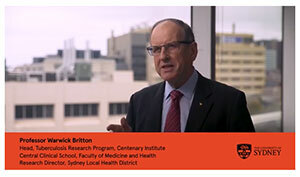 Sydney Local Health District’s Director of Research and 2004 medal winner, Professor Warwick Britton, said RPA Medal winners, were high achievers indeed. “The RPA Foundation Research Medal is always awarded to a person of great vision, passion, and academic excellence,” he said. “And Professor Solomon is no exception. He is leading the world in research on pelvic exenteration, focussing on innovative surgical techniques and the short and long term clinical and patient reported outcomes. The centre, known as SOuRCE, was established as a multidisciplinary, academic research unit dedicated to the advancement of evidence-based surgical practice through the conduct of outcomes-orientated surgical research. Professor Britton said the Pelvic Exenteration Research Program, led by Professor Solomon and SOuRCE, was the first to combine pioneering work addressing the most technically challenging lateral pelvic recurrences and a database of clinical and patient reported outcomes to monitor and evaluate health service impact and patient survival and quality of life. RPA General Manager Deborah Willcox said Professor Solomon was a true world leader who deserved the hospital’s highest accolade. “This lateral pelvic exenteration surgical approach is not performed elsewhere nationally or internationally and reflects the development of complex surgical techniques in a highly specialised unit” Ms Willcox said. “Under Professor Solomon’s leadership, the RPA colorectal team has demonstrated a zero per cent mortality and acceptable morbidity with this approach. “RPA has the largest single centre experience in sacrectomy for cancer with a series of more than 100 cases and has developed two different approaches. It is the only unit in Australia that performs high sacrectomy. In 2013/14, Professor Solomon and the multidisciplinary surgical team undertook 53 pelvic exenteration surgeries. He has received more than $9 million in peer reviewed research grants from the National Health and Medical Research Centre, Cancer Australia, Cancer Institute NSW. The recipient of the medal is chosen by a panel of three judges. 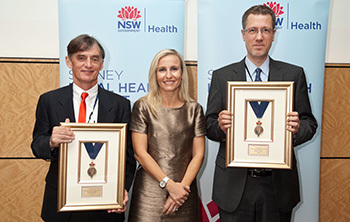 This year, the judges were: Professor Warwick Britton, Bosch Professor of Medicine and Director of Research, Sydney Local Health District and winner of 2004’s RPA Medal; Professor Steve Chadban, Director of Kidney Transplantation at RPA and winner of 2011’s RPA Medal, and Professor Craig Anderson, Professor of Neurology and winner of 2008’s RPA Medal. 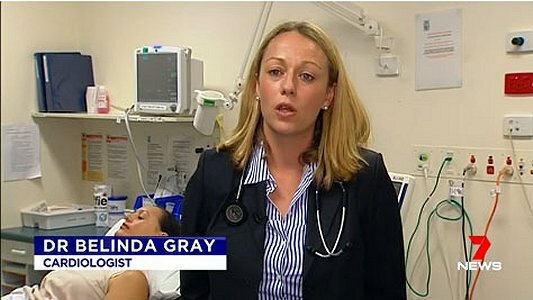 The medal was presented to Professor Solomon by Channel 9 health reporter Kate Creedon. 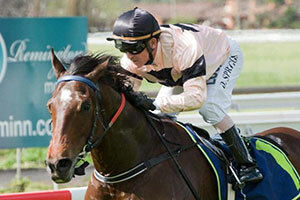 Channel 9 kindly provides the prize money each year. Royal Prince Alfred Hospital will host Australia's first dedicated organ donation and transplantation unit, in a bid to increase donation rates across the state. The NSW Minister for Health and Minister for Medical Research, the Hon Jillian Skinner, today visited RPA, which provides world-leading transplantation services, the only liver transplant unit and the largest kidney transplant unit in NSW, to make the announcement. The plan also includes the creation of the nation's first dedicated academic position for organ donation for transplantation, a conjoint appointment with the University of Sydney; the re-establishment of an SLHD organ and tissue donation steering committee; and additional staff to continue to provide 24/7 coverage throughout the hospital, strengthening our Whole of Hospital approach to organ donation and enhanced auditing program. The Chief Executive of Sydney Local Health District, Dr Teresa Anderson, said the District was committed to being an Australian leader in organ donation for transplantation yet it was clear that significant progress was needed to achieve greater levels of donation. 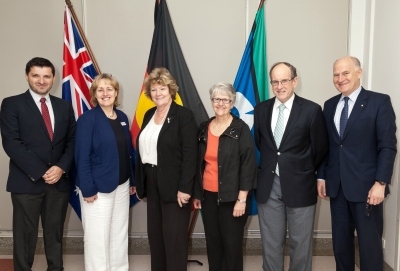 "We have come a long way but there is still much to be done to ensure that Australia's organ donation for transplantation system meets the nation's present demand for organ transplantation and its future needs without significant change," she said. "Access to organ donation for transplantation is essential to ensure the best outcomes are achieved for people with end stage disease such as kidney, liver, heart, lung or pancreas failure or for people receiving tissue donation (bone, corneas or skin) to improve the quality of their lives. "This is especially so given that the demand for transplanted organs is anticipated to continue to grow with the ageing of Australia's population and the increased incidence of lifestyle diseases such as obesity, type 2 diabetes, hepatitis C, cancer and pancreatitis." 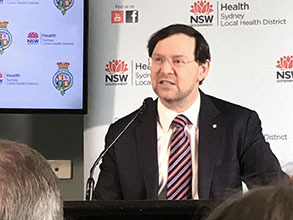 The acting co-medical director of the NSW Organ and Tissue Donation Service, and RPA intensivist, Associate Professor Michael O'Leary, said today's announcement was another significant milestone of organ and tissue donation achievements in NSW. "Over the past five years, NSW Organ and Tissue Donation Service has helped more than 1300 recipients through the generosity of more than 443 organ donors - 51 per cent more donors than there were when our service was first established," he said. This year the prestigious Royal Prince Alfred Foundation Medal will be awarded for the 15th time and for RPA's Director of Research, Professor Warwick Britton, it marks an exciting time in the history of medical research within Sydney Local Health District. "RPA has had a tradition of research since 1882 when we first became a major teaching hospital of the University of Sydney, but this year we will present the first RPA Medal since the launch of Sydney Research," he said. "The formation of this new hub of 16 hospitals, medical research institutes and educational facilities has already allowed better sharing of knowledge and resources and facilitated more unified and coordinated grant applications." 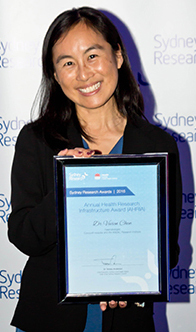 Since its inception, Sydney Research members have received significant grants including more than $6.8 million from the NHMRC for RPA's Drug Health Services to conduct integrated human and regulatory toxicology research and more than $14.4 million for the Woolcock Institute to study safety productivity and alertness. The annual RPA Medal carries a prize of $50,000 in research funding and is awarded for excellence and outstanding achievement in medical research. Last year Professors Paul Torzillo and Wolfgang Weninger shared the honour, each receiving $35,000 to invest in further research. 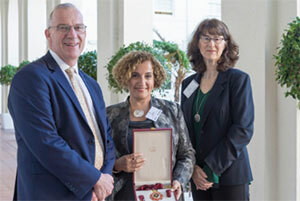 Professor Torzillo was recognised for his research into Aboriginal health and Professor Weninger was awarded for his work examining how bacterial virulent factors inhibit the function of the immune system. This year's award presentation will take place on 5 September. Doctor Glen Reid of the Asbestos Disease Research Institute at Concord Hospital has won the Best Poster Award at the WIN 2014 Symposium. The symposium is a global event dedicated to breakthroughs in biomarker investigations and combination therapies for cancer. Scientists and clinicians from all over the world are invited to share their findings in the pursuit of precision medicine for highly personalised cancer therapies. This field of research aims to attack specific abnormalities in an individual patient's cancer with smart combinations of targeted and immunological agents. 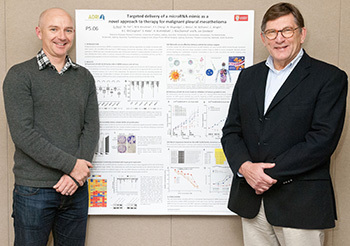 Dr Reid's poster covers part of the translational research leading to a clinical trial for a new treatment approach for malignant pleural mesothelioma and non-small cell lung cancer. Director of the institute, Professor Nico van Zandwijk, said the award was a remarkable honour. "We are very proud and congratulate Dr Reid on being one of the two awardees at this prestigious conference," Professor van Zandwijk said. District Chief Executive, Dr Teresa Anderson, congratulated Dr Reid on his well-deserved recognition. 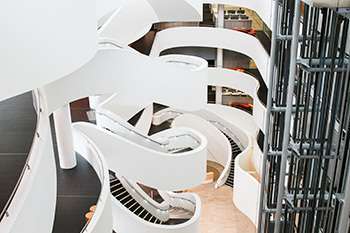 The Charles Perkins Centre research and education hub, a state-of-the-art $385 million teaching and research facility, officially launches this month at the University of Sydney. The hub is the heart of the Charles Perkins Centre, a world-leading initiative that brings together international experts from a broad spectrum of academic disciplines to find real-world solutions to some of the biggest challenges humanity has ever faced: obesity, diabetes, cardiovascular disease and related conditions. Unlike traditional research initiatives that have approached these conditions as medical illnesses, concentrating solely on their biology, the Charles Perkins Centre looks at problems from every angle. The Centre sees biologists, ecologists, physiologists, geneticists and clinicians working with economists, psychologists, ethicists, lawyers, agriculturalists and urban planners to drive groundbreaking discoveries. Charles Perkins Centre Academic Director Professor Stephen Simpson said the centre provided a new model of research and education. "The Charles Perkins Centre will inform and reform the health of our nation by providing an environment in which genuine new collaborations and opportunities can emerge and produce real solutions to drive lasting change," Professor Simpson said. The Centre also draws upon a strong network of medical research communities, global health agencies, hospitals, governments, entrepreneurs and industry to ensure the translation of research into results. Regional hubs at the University of Sydney's clinical schools in Broken Hill, Nepean, Westmead and North Shore will also inform the Centre's work. "We are immensely excited to launch the Charles Perkins Centre Research and Education Hub, which will play home to an initiative that is already changing the way we think about some of the most destructive health issues in the world," said Dr Michael Spence, Vice-Chancellor of the University of Sydney. "The Charles Perkins Centre represents a completely new way of conducting research. 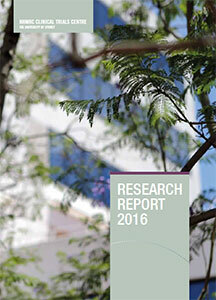 The breadth and depth of multidisciplinary research conducted by the Centre is unparalleled both in Australia and internationally." Located on the north-west boundary of the University's Camperdown Campus, the Charles Perkins Centre research and education hub will also spearhead a vibrant research and education precinct linked to nearby affiliated medical research institutes and hospitals. The purpose-built facility was supported by the federal government's Education Investment Fund and provides the latest facilities and technology for more than 1500 undergraduate students, 900 researchers, and postgraduate students (OR early career researchers). Tumour-hunting cancer killers…Dr Nico van Zandwijk. One of Sydney Local Health District's leading researchers will this month give a presentation on a new nanotechnology treatment he believes could become a "magic bullet" in the fight against mesothelioma and possibly other forms of lung cancers. The presentation will be part of the Sydney Local Health District's Research and Innovation Symposium on 16 May. Professor Nico van Zandwijk explained the new treatment aimed to halt tumour growth by introducing synthetic microRNAs, the lack of which is responsible for the rapid growth of mesothelioma cells. The treatment is particularly sensitive and must be packaged inside nanotech minicells, which are coated with a tumour specific antibody that should guide them directly to the tumour. "We expect that, when injected in the bloodstream, the minicells will deliver the microRNA payload to the tumour cells, thereby initiating a stop of tumour growth," Professor van Zandwijk said. "It is still early days, but the whole development is very exciting." Mesothelioma is a rare asbestos related cancer but Australia has one of the highest rates in the world. More than 13,000 cases have been diagnosed in Australia since 1980 and experts believe that asbestos-related illnesses will not peak until 2020. Professor van Zandwijk, who is the Director and Professor of the Asbestos Diseases Research Institute Medicine at Concord Clinical School, said the development of the treatment was now entering the first studies in human patients to determine optimal dose and safety. "The next step, phase two, will carefully evaluate the efficacy of the new treatment approach," he said. If these studies were positive, the treatment could make an enormous difference to the health outcomes of mesothelioma patients and that other tumour types could also benefit from this approach, particularly lung cancer, he said. On the attack... Associate Professor Martin Gallagher from the Concord Hospital Clinical School. Researchers led by nephrologists at Concord Hospital, The George Institute for Global Health and the University of Sydney have found more patients die from acute kidney attack than heart attacks. Research leader and Associate Professor of Medicine at Concord Hospital Clinical Schoo,l Martin Gallagher, said the study found only one third of acute kidney attack patients were alive 3.5 years after diagnosis. "We were surprised by our findings as this is a higher death rate than that seen in recognised high risk conditions such as heart attack," A/Prof Gallagher said. "The burden of acute kidney attack is increasing and it is much more common than the chronic kidney disease that requires long term dialysis." Up to 50,400 Australians and 11,200 New Zealanders a year are diagnosed with acute kidney attack which, when requiring dialysis, is the most expensive hospital admission. Acute kidney attack can be caused by x-ray contract fluid, severe infection, surgical procedures and sudden drops in blood pressure. "It is a common complication during hospitalisation and is associated with high death rates, ill health, and prolonged hospital stays," A/Prof Gallagher said. The study, published in the journal PLOS Medicine, also showed that higher doses of continuous dialysis for acute kidney attack patients did not reduce high mortality in the longer term. 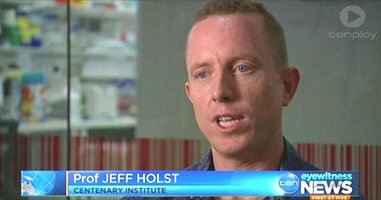 "We looked at current treatment methods for these patients, but found that they don't work," A/Prof Gallagher said. "What we urgently need now is to find new treatments and approaches." The study also found that surviving patients had very high rates of ongoing kidney disease. "The study may also see enhanced focus on new treatments already widely used to prevent progression of chronic kidney disease, including ACE inhibitors and RAS blockers, as a way of improving outcomes," A/Prof Gallagher said. A/Prof Gallagher and his team are now working on other studies looking at prevention of acute kidney attack from radio-contrast use, which accounts for up to 11 per cent of hospital-acquired acute kidney attack. Obesity, diabetes and cardiovascular disease are the leading causes of death, disability and reduced quality of life in Australia. These will be the initial areas of focus for the newly completed $385 million research and education hub within the Charles Perkins Centre. The new centre will accommodate more than 1,500 students and 900 research staff and higher degree by research students throughout a 49,500 square metre campus including state-of-the-art wet and dry laboratories and a biobank. “This centre will bring together some of the best academics, researchers and health professionals from the University of Sydney, Royal Prince Alfred and beyond,” said Dr Teresa Anderson, Chair Sydney Research. The centre’s 1,800 square metre clinical research facility will be collaboratively managed by the university and Sydney LHD and includes a metabolic kitchen, interview areas, clinic rooms, gymnasiums, physical testing facilities, phlebotomy bays and eight day-stay beds. Dr Anderson said a major priority for the centre would be to translate these breakthroughs into practical benefits for individuals, communities and nations. “Researchers will be able to work hand-in-hand with communities, governments and the private sector to ensure that their ideas can receive the exposure and support necessary to reach their full potential,” Dr Anderson said. 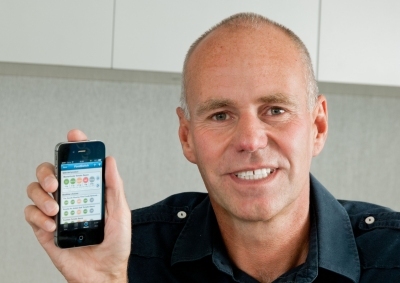 More than 400,000 Australians are choosing healthier foods while shopping thanks to a smartphone app developed by The George Institute for Global Health. The FoodSwitch app allows users to scan packaged food barcodes using the phone’s camera and then suggests healthier alternative products. Professor Bruce Neal, of The George Institute for Global Health and The University of Sydney, said so many Australians had embraced the app that it would now be launched in the United Kingdom. The app launched with just 17,000 items but through the crowd sourcing function, which allows users to contribute, it now has more than 50,000 individual products and another 25,000 due to be added through monthly updates. A version of the app is already available in New Zealand and will launch in the UK with more than 100,000 food and drink products in its database. Professor Neal said the app aimed to put the power back in the hands of the consumer and that it could pressure food retailers into stocking healthier options. The app has received more than 2000 positive feedback emails with many people explaining how it had helped them with their food purchases. 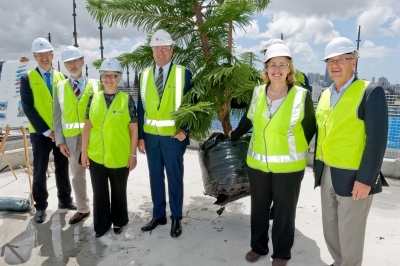 The $67 million Missenden Mental Health Unit is nearing completion, with builders celebrating reaching the highest point of construction recently. The NSW Minister for Mental Health Kevin Humphries was on hand to help toast the major developmental milestone with a tree planting ceremony. The new unit is co-funded by the NSW Government, Sydney Local Health District and the University of Sydney and is due to open later this year with 40 relocated mental health beds plus seven mental health unit research beds. There will also be capacity for additional mental health facilities and ambulatory care services in the future. Topping out ceremonies date back to the year 700 when Scandinavians would lay sheaths of grain at the highest point of a building for good luck. On completion the Missenden Mental Health Unit will add to the unique collection of world leading experts in health and medical research belonging to Sydney Research. The power of many ...Sydney Research members with NSW Health Minister Jillian Skinner. 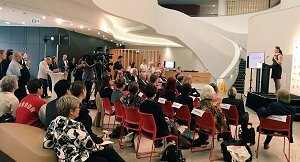 The NSW Minister for Health and Minister for Medical Research, Jillian Skinner, joined some of Australia’s leading researchers to celebrate the launch of Sydney Research, one of the most prestigious research hubs in the state. 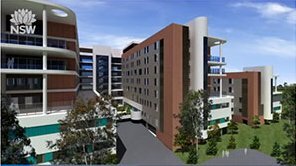 Featuring a collaboration of 16 hospitals (including Royal Prince Alfred, Concord and Sydney Dental), medical research institutes and educational facilities across the Sydney Local Health District campus, Sydney Research is one of eight hubs being established in NSW to ensure laboratory discoveries benefit patients at the bedside. “With an investment of more than $200 million per annum and the state’s first long term medical research plan, the establishment of Sydney Research is a pivotal step towards delivering NSW as a leader in health and medical research,” Mrs Skinner said. 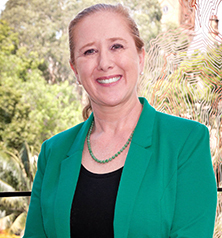 The Chief Executive of Sydney Local Health District, Dr Teresa Anderson, said the hub allowed researchers to better share knowledge and resources. “The power of many also means we can consolidate our research, and make more unified grant applications,” Dr Anderson said. Members include Royal Prince Alfred Hospital; Concord Repatriation General Hospital; Sydney Dental Hospital; the University of Sydney; Centenary Institute; the Woolcock Institute for Medical Research; the Heart Research Institute; ANZAC Research Institute; Asbestos Diseases Research Institute; the George Institute for Global Health; Brain and Mind Research Institute; Centre for Education and Research into Ageing; Lifehouse; the NHMRC Clinical Trials Centre; the Baird Institute and the Surgical Outcomes Research Centre. 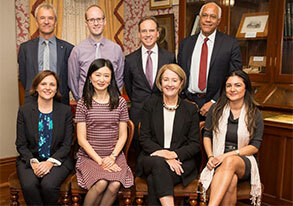 Since its inception, four National Health and Medical Research Council grants have been awarded to Sydney Research members, including an $8 million grant to The George Institute and another three grants of $2.5 million each to the Centre of Research Excellence in Medicines and Ageing, the Brain and Mind Research Institute and the Woolcock Institute.